I finally feel as though the months are going by at the rate they should, it's lovely as I'm getting to take in every last moment of each month and I'm not stuck in that feeling that it's passed before I have had time to know it's in front of me. Little one, you're ten months old. Your ninth month has been one of change, you've began nursery and I'm at work. You no longer solely depend on me every single day and as lovely as that can be, I miss it terribly. Instead of driving a mini wedge between us, which is exactly what I imagined would happen when we spent less time together, it's made us closer - something I am incredibly happy about. Life has been a lot easier with you during your ninth month. You're easy, I know you and you're more than aware of that. When you start to do your little 'cry that isn't really crying' cry, I simply shoot you a glance and you've turned it into a giggle - even you can't take yourself seriously. Your personality has probably grown the most this month, you have this smile that I've managed to catch on camera, it's a fake, cheesy grin that a lot of us have seen now and it's quite possibly my favourite thing that you do. Just before you hit the ten month mark, you managed to pop those little toothy pegs that have really bothered you over the past week. I'm so thankful as I did wonder if you'd be toothless by your first birthday. More about your start at nursery, inevitably it's caused you to pick up a variety of coughs and colds already but we don't mind so much as we know it'll set you up for a resilient immune system by the time you're graduating for school. You've yet to have an off day in your month in childcare, something I am truly grateful for because I don't think my heart could handle knowing you're upset and I can't comfort you. In terms of more milestones, crawling began in your eighth month and now I think if there was a Ralph Schumacher of the baby world, you could rival him. You're favourite thing to do is head on out of the living room and attempt to scale the vacuum under the stairs, if ever you went missing I think I'd check there first. Speaking of scaling, cruising is the new in thing for you, as soon as you're down in the morning you're straight over to anything you can pull up on and walking alongside it. Those first steps are just moments away I can feel it. You are still an incredibly sensitive soul, just last weekend in the barbers a little girl was crying and it sent your bottom lip quivering. Heaven forbid Noah has a meltdown moment with the tears flowing because you join him, it breaks your heart seeing or hearing him upset as he really is your idol. Noah dotes on you and you him, daily I'm reminded just why we decided to have another child, because your relationship is so sweet, it's better than I could have ever imagined. We're nearing your first birthday now, I just booked it off work and that really set it in stone just how close we are. 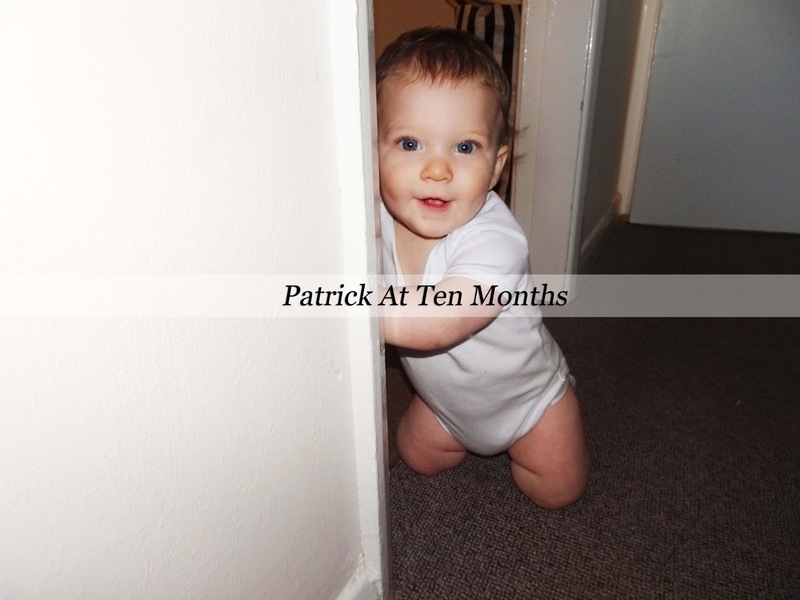 It'll be a bittersweet time because of everything we went through this time last year, but look what we've gained from such a difficult experience, I wouldn't change that for the world because Patrick, you are one whole half of our world! Oh I love the way this is written, when he grow up he can read these with a smile :-) absolutely adorable! How exciting that he's so close to taking those first steps but also not because that means he's growing up! I can't believe he is 10 months old already. Schumacher of the baby world 😂 bless him! OH goodness, Em that made me quite emotional!! I love that first photo of him and the fact that he's such a sensitive soul. It must be lovely to see the boys growing up so close, that's exactly why I want another too! !